This is a new book we've published for the new generation of radio broadcaster. Online radio has already spawned around 100,000 new choices in radio listening. We believe that internet radio (also known as web radio, audio streaming, or simply online radio) is on the verge of becoming the biggest form of media. Streaming radio programmes to listeners began in the 1990s but has been constrained by the capacity of the internet. To date there has simply not been the space to cram in all the date needed to make all the radio stations available to all listeners; and that's the way its been done so far with effectively a single connection between each listener and the station. Capacity is now mushrooming, with 3G and more recently 4G making data rates of up to 33 Mbps becoming common place. Proving tests have recently been done (see BBC report here) on new 5G equipment, which achieved speeds of 3.6Gbps, which is a huge bump in speed. When the new networks come on line there will no longer be 'lack of space'. With the constantly falling cost of the necessary studio equipment (much is now digital and most of the processes can be automated) the costs of running the radio studio are now within the reach of almost everyone. We are predicting that the number of radio stations will begin to soar, from the present day 100,000 to at least 1 million, perhaps more. All of those stations will enjoy global coverage, heralding a new form of media. The same is true for video - television, however radio has a huge advantage over television as you can multi-task while consuming it. You cannot do housework, or drive a car or many other things while watching TV. But you CAN while listening to the radio! As broadcast consultants, our team are increasingly often approached by people wanting to help in setting up radio stations. Its impossible to provide a 'open to one' service to any but the largest stations, so we have published a book setting out the way in which internet radio (aka web radio, online, or streaming audio) works. 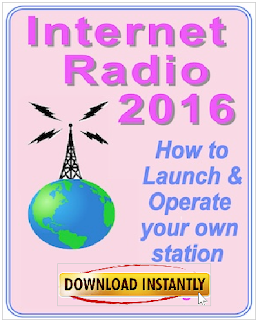 What equipment is needed, the software necessary to semi automate radio stations, and how to get transmission onto the internet at affordable prices. We've put everything into an eBook, which can be read on any electronics device - a desk top or laptop computer, a tablet, such s Kindle, or even on a smartphone! The book has over 77,000 words, over 353 pages - everything you need to know is split into 38 Chapters (see details alongside). It costs only £6.89 (or $9.99) and you can download a copy INSTANTLY. For more details click HERE simply or the book cover above. 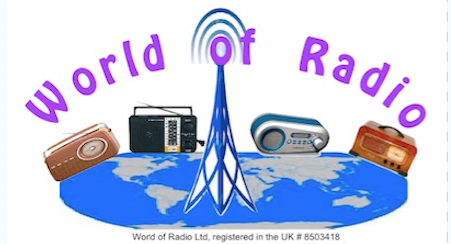 The World of Radio web site has some extracts from the book and the very latest information too. The world of internet radio streaming is rapidly changing and the site tries to keep up to date with the latest developments.